WACO, Texas – No. 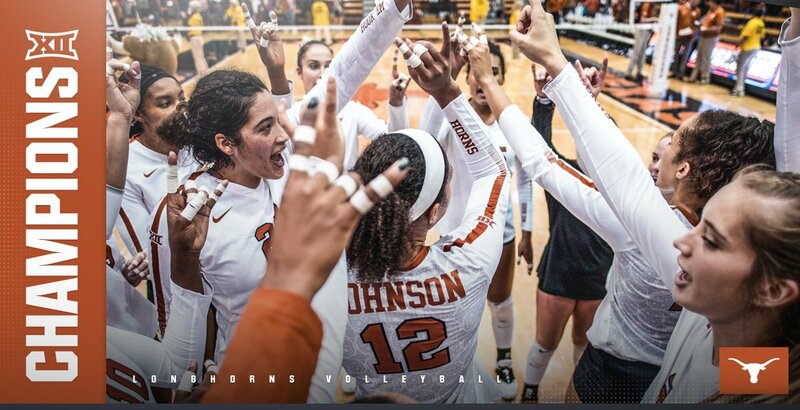 5 Texas Volleyball defeated Baylor, 3-1 (22-25, 25-19, 25-22, 25-14) at the Ferrell Center on Friday night to win its 11th Big 12 Conference Championship. The Longhorns have won seven out of the last eight Big 12 titles and 24 conference titles (13 Southwest Conference titles). Junior Micaya White led the Longhorns with 17 kills (.326) and 11 digs. Freshman Jhenna Gabriel led Texas with a career-high 47 assists, also adding four digs, three blocks, two kills, and one ace. Junior Logan Eggleston had double-digit kills with 13 (.273), while also adding five digs and two blocks. Senior Yassmeen Bedart-Ghani had nine kills on 17 swings (.353), two digs, and two blocks. Junior Brionne Butler had seven kills (.400), one dig, and three blocks, while senior Morgan Johnson had six kills on nine swings (.667) and a team-high five blocks. Freshman Sydney Petersen led the Longhorns with 16 digs and junior Claire Hahn finished with six digs, two aces, and one assist. Texas will face Texas Tech in Lubbock on Wednesday, Nov. 21 at 6 p.m. CT. The Longhorns out-blocked the Bears, 8 to 3.5. WACO, Texas – Baylor volleyball (18-8, 10-5 Big 12) won its opening set but couldn’t prevail in a 3-1 loss to No. 5 Texas (18-4, 13-1 Big 12) Friday night at the Ferrell Center, 22-25, 25-19, 25-22, 25-14. The Bears played in front of the fifth-largest crowd in program history with 3,016 people in attendance, topping the all-time attendance list for the second time this season. Friday’s loss snapped a season-best six-match winning streak and moves BU to 6-1 in the second half of Big 12 play. Senior Aniah Philo led all players with 18 kills on a .279 hitting efficiency and led the Bears in scoring for the third time this season. Joining her in double figures was Yossiana Pressley (11 kills) who posted her 10th double-double of the season with 10 digs. Splitting time at setter, Hannah Fluegel posted a team-high 30 assists while Hannah Lockin added 20. Baylor got out to a slow start but took an 11-10 lead with a block from Gia Milana and Shelly Fanning. After a ball handling error tied it at 19-19, the Bears went on a 4-1 run to force the UT timeout. Pressley closed out the set with a kill and a service ace to give the Bears an early advantage, 25-22. BU had five errors to open the second set and called a timeout trailing 7-1. The Bears worked their way back into it with a kill from Philo at 12-9. Texas went on a late run and used a kill to close out the frame, 25-19. Set three saw 15 ties and five lead changes. The Bears and Longhorns were deadlocked at 16-all, but a kill from Milana and Fanning gave BU the 18-17 lead. Texas took the late lead and Baylor couldn’t recover, 25-22. BU fell flat in the fourth frame, hitting .062 for 10 kills and committing eight errors. Fanning and Philo added three kills as the match ended in four sets, 25-14. The Bears played in front of the fifth-largest volleyball crowd in program history (3,016). Aniah Philo led all players with a match-high 18 kills for her 15th double-digit match of the season. Yossiana Pressley produced her 10th double-double of the season with 11 kills and 10 digs. Hannah Fluegel (30 assists) led the Bears for the seventh time in the last 10 matches. Tara Wulf had a match-high 16 digs in the back row for her 22nd double-digit match of the season. Three Bears posted double-digit digs: Wulf (16), Hunt (11) and Pressley (10). Baylor moves to 6-1 in the second half of conference play. Baylor moves to 2-85 all-time against the Longhorns. 3,016 – the top-five attendance at Friday’s match. The Bears (18-8, 10-5 Big 12) close out the regular season against West Virginia Wednesday at 7 p.m. CT on Senior Night. Aniah Philo, Ashley Fritcher and Jaelyn Jackson will be honored in a post-match ceremony.